Holy crud-muffins. I thought I vaguely remembered this show, and a lot more came back to me as I watched, but I had forgotten just how utterly insane it is. If you were not a Nicktoons watcher in the 90’s, you might have missed this one. It’s about Rocko, a wallaby who moves to the city with his dog Spunky, and his friends (a neurotic turtle-thing and a big dumb cow raised by wolves) and his enemies (the catfish-thing that lives down the street). It’s sometimes satirical, often subtly adult, and sometimes just gross-out. It wasn’t as biting or as gross as something like Ren and Stimpy, though. 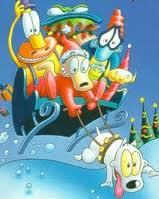 In this episode, Rocko’s feeling down about being on his own for the holidays, so he invites his friends over. A game of telephone later, and the whole town’s invited to a party, along with some magic Christmas elves that moved in across the street. Of course, professional jerkass Mr. Bighead gets involved, and it looks like Rocko will be alone for Christmas after all, until his new friend the littlest elf shows up to keep him company. Erin kept exclaiming at things while we watched. “That lady had a hook for a hand!” “That person was a foot!” “What the hell? !” I admit I was surprised and rather disgusted by the running joke about the constipated cloud, but the rest of it was familiar to me. I wouldn’t say that I necessarily recommend this, but it had its moments, and it was definitely unique.